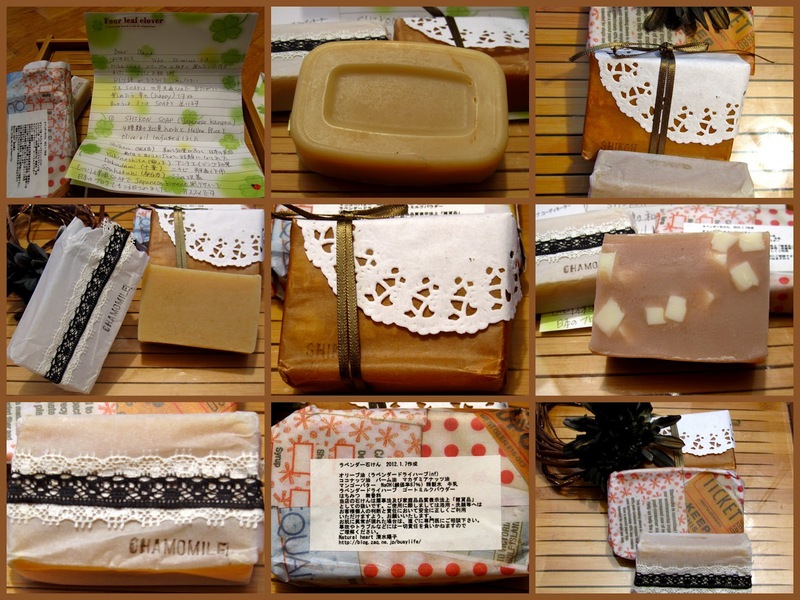 Like most other soapers, I'm always curious to find out which local ingredients others use for their soaps. Mika from Savonnerie Mika organized a soap swap with Japanese soapers. She was our contact, selected our swap partner because I'm sure otherwise there would have been language problems. Yesterday I received my soaps from a soaper called Yoko. She sent me three of her soaps: Lavender, Shikon and Chamomille. My first impression was that all the Japanese I know are so gifted and creative when it comes to packaging. It might be a sterotype but I don't know any other country in the world where so much emphasis is put upon the outward presentation of a gift! I found Yoko's packaging to be very original because she used natural and also recycled material - such as Starbucks wrapping paper! The smell when opening the package was simply devine - I will have to find out which exact combinations of EOs she used! Lavender Soap: The classic amongst soaps! Yoko used Lavender infused Olive Oil for hers, Coconut Oil, Palm Oil, Macadamia Nut Oil & Mangobutter and in addition milk, goat's milk powder and honey. Sounds heavenly! From what I understand when reading the ingredients list, the soap is unscented although you wouldn't think because it has a slight milky smell with a hint of lavender. Chamomille Soap: The smell of this soap is so unusual - very warm and comforting - sorry, I don't know how to describe it better...Here she used Chamomille infused Olive Oil, Coconut Oil, Palm Oil & Hazelnut Oil. Also, St. John's Wort, Linden and Calendula herbs, honey, Benzoin & Chamomille EO. Shikon Soap: Shikon is Gromwell Root - which I have to admit, I've never heard about in either Japanese, English or German - but my internet research found out that shikon is used in skincare for its antioxidant properties. The Shikon soap also contains Olive Oil (infused with a number of herbs which are totally unknown to me) , Coconut Oil, Palm Oil, refined Sesame Oil, Almond Oil, as well as Yoghurt, Maple sirup, Azuki Powder, soap confetti. It's scented with a mixure of the following EOs: Clary Sage, Myrtle, Ylang Ylang, Sandalwood & Marjoram. Thank you, Yoko-san, for the lovely soaps!!! Oh, you've got swap soaps finally!! 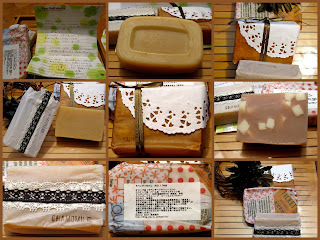 All these soaps look very nice.As you write, I think also her wrapping is very special and original! Super Idee, Seife international :) .